Welcome to the Irish Women’s Network of Ontario! The Irish Women’s Network of Ontario (IWN-ON) was founded on Nollaig na mBan (Women’s Christmas) January 6, 2012 in Ottawa, Ontario. Shortly after becoming President of Ireland in 1990, Mary Robinson famously placed a candle in the window of Áras an Uachtaráin as both a symbol of the Irish diaspora and as a welcome home beacon. Robinson’s symbolic light became an acclaimed symbol of an Ireland thinking about its sons and daughters around the world. 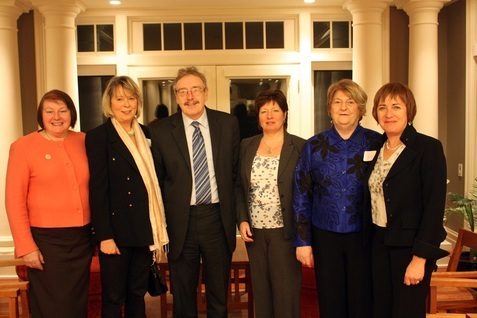 The Inaugural Gathering was held on February 15, 2012 at the residence of the Irish Ambassador, His Excellency Dr. Ray Bassett. The event brought together over 50 women of the Irish Diaspora and was a stimulating and memorable evening. We believe that IWN-ON has the potential to tap into a reservoir of knowledge and experience of Irish women by creating opportunities for networking, conversation and mutual support. The network is volunteer based, membership driven and is open to all women of the Irish Diaspora. Membership is free. Volunteers and ideas welcome.